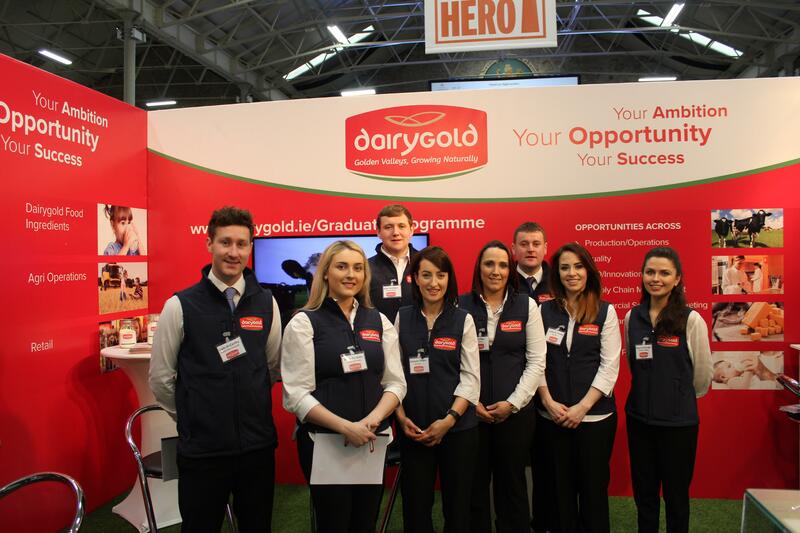 On Thursday 30th March last, a cross functional team from Dairygold attended the Agri Careers Fair held in the RDS, Dublin. This event is organised by the Irish Farmers Journals in association with open eir. The Agri Careers Fair was held for the first time in 2016 and primary purpose of the event is to highlight agricultural roles currently available in Ireland and in international locations. One in eight jobs in Ireland is supported by the agricultural sector so it is a crucial pillar of the Irish economy. This year’s event was officially launched on the day by Mary Phelan (Careers Editor, Irish Country Living), Carolan Lennon (Wholesale Managing Director, open eir) and Justin McCarthy, editor of the Irish Farmers Journal. Dairygold were one of approximately 50 exhibitors on the day and held a prime location in front of the Main Stage where there were various talks held throughout the day including a discussion involving our Group Head of HR, Adrian Beatty. The Agri Careers Fair is a great opportunity for Dairygold to showcase the Society as a dynamic, ambitious organisation where there are significant opportunities for career development. This year Dairygold had over 20 live roles to showcase and we were looking to speak to potential candidates with backgrounds in finance, retail, R&D, production and quality. On the day we also promoted our 2 year Graduate Development Programme. Throughout the day we spoke to many potential candidates who were very interested to hear about our unique Graduate offering including a fully accredited Level 6 Diploma in Management, the opportunity to rotate up to 3 times during the 2 year programme, a structured mentor and buddy system as well as opportunities to participate in cross functional continuous improvement projects. All information relating to the live roles advertised on the day of the Agri Careers Fair are available on the Dairygold Website under the “Our People” section. Further information on the Graduate Development Programme which will be opening online this September, is also available under the “Our People” section of the Dairygold website.